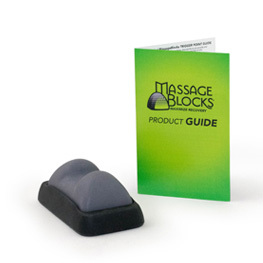 Stop Muscle Spasms of the Low Back with targeted Trigger Point Therapy! Accomplish at home what used to only be possible with the support of a trained therapist. We have found that use of a single low back tool can be too intense for many. However, for the brave of heart, this tool is quite useful. It targets the muscles very close to the spine and just above the sacrum. If your pain and tension is further out from the spine and just above or below your pelvic ridge, we recommend the small Knot Finder. The tools in the Low Back Kit force the muscles of the low back to relax by leveraging your own body weight to apply Trigger Point Therapy to the mutifidus and longissimus muscle groups. The base is there to accommodate thicker carpet pile, varying anatomy or just because it feels right. Generally speaking, if your pain radiates below the knee, Massage and Trigger Point Therapy alone will be of limited benefit. We always recommend working with a trained therapist to best understand your condition prior to addressing any recurring pain. The experience of deep tissue massage may be intense, even overwhelming, to those experiencing it for the first time (it should never hurt). Always remember to go slowly, and if it hurts, stop immediately and speak with your health care provider before trying again. Please see our Warning and List of Red Flags.